I think there is a little story here. Dr Ivan Cherniavsky was joint creator of the Pokutia C.M.T. overprint issue of 1919 together with Major Turbatu of the Romanian occupation forces. I have written about this in two previous Blogs. You can use the Labels below to find them. Cherniavsky was a lawyer in charge of the Kolomya District Court and most of the existing non-philatelic envelopes franked with the C.M.T. issue are addressed to the Court, where they were collected by Dr Cherniavsky. The clue is in the green colour of the paper adhering to the stamp. 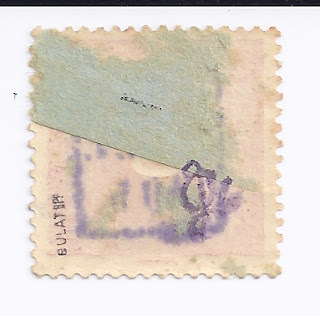 This stamp was removed not from an envelope but from an entire letter - and more specifically a Court Delivery Letter. Such letters or entires were often on thin greyish or greenish paper. 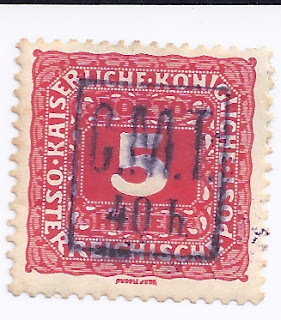 In Pokutia, as in the rest of Galicia, a Court Delivery post operated which in the Austrian and Polish periods used distinctive adhesives, the Gerichtszustellungmarken. The stamp above has also been used as a Court Delivery stamp - and Cherniavsky had to peel it off the letter because the document to which it was affixed had to stay in the Court archives, unlike the lawyers' envelopes which he could remove complete. Cherniavsky applied his Monogram after peeling the stamp off the Court Delivery document. The stamp is uncancelled. Twenty years ago John Bulat - who at some point acquired material from Cherniavsky's collection - sold me three or four examples of this stamp which did not have postal cancels but did have paper on the back. He was puzzled by them. I think I have solved the puzzle. In fact, I want to go a bit farther and suggest that the C.M.T. overprints on Austrian Postage Due stamps (Bulat 9 - 13; this is an example of #9) were intended as Court Delivery stamps and were indeed used as such. Maybe one of my readers can produce a complete Court Delivery document to support this claim? The stamp is for sale.